Today his name is usually mentioned in connection with Poussin, whose first teacher he was. Varin himself was trained in Beauvais by Franois Gaget, then worked as a journeyman in the workshop of Duplan in Avignon (1597-1600). Maria de Medici became his patroness in Paris, where he also assisted in decorating the Luxembourg and became "peintre du Roi" in 1623. He adopted some formal elements of the Fontainebleau school by emulating them at a somewhat superficial level, and painted his figures in strangely elongated proportions on his oversized canvases. 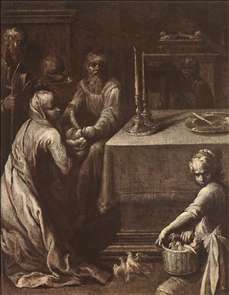 See more details about "Presentation of Christ in the Temple"